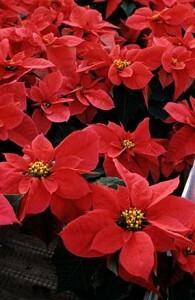 2013 Poinsettia Open Houses will be held Tuesday, Dec. 3, for growers and industry suppliers and Sunday, Dec. 8, for the public. Growers are welcome to visit on either day. Both events are free, and no registration is required. Come see the latest trials with over 100 cultivars and studies on Augeo, substrates, propagation and color combinations. The Industry Open House will be held at the Horticulture Field Laboratory on Tuesday, Dec. 3 from 9 a.m. – 2 p.m. Co-Sponsored by the North Carolina Commercial Flower Growers Association. The Consumer Open House will be held at the Ruby C. McSwain Center at the JC Raulston Arboretum on Sunday, Dec. 8, from 1 p.m. – 5 p.m.